Welcome to my not so new series, Bullet Journal 2.0. 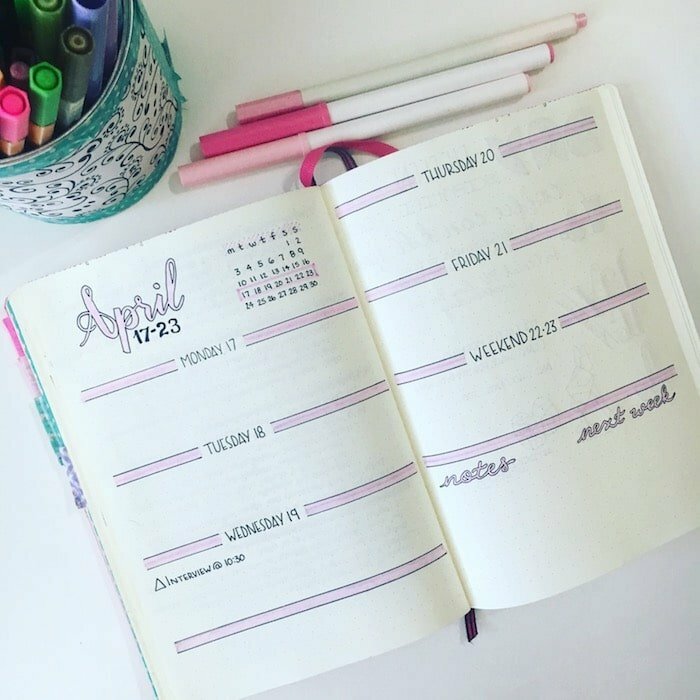 In this series, I’ll be discussing a number of topics, including what a bullet journal is, future logs, monthly spreads, weeklies vs. dailies (hey, you’re on this post), habit tracking, collections, getting over the fear of starting, what to do before you get started, FAQs, and a final wrap-up with my top tips and pointers. If you were counting, that was 10 topics. One topic a week for ten weeks! I dug myself a deep hole here, but with your support, I’ll pull through. This is part 5 ladies and gents! I may have been a little overly ambitious about a 10 part blog series. But, have no fear, we are halfway there. 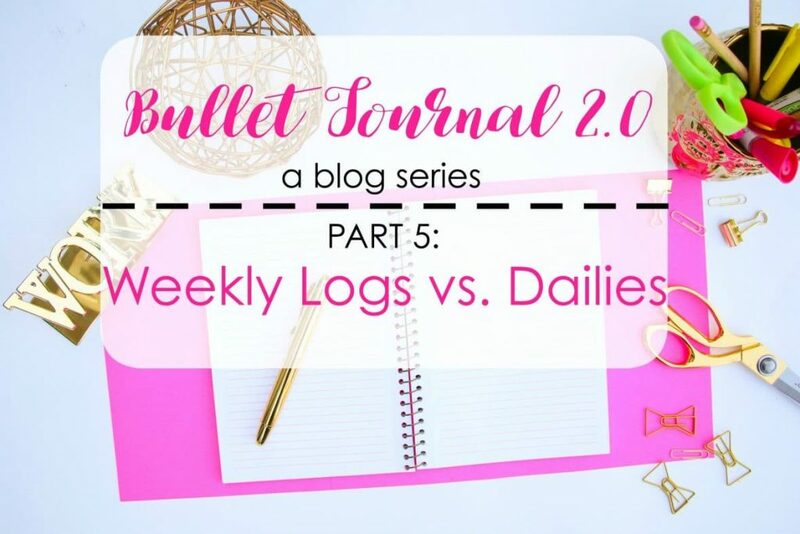 And, this week I’m discussing the difference between weekly logs and dailies, when to use them, and my own personal preference. So sit back, grab some coffee, or wine– what the hell, have a beer, and enjoy. 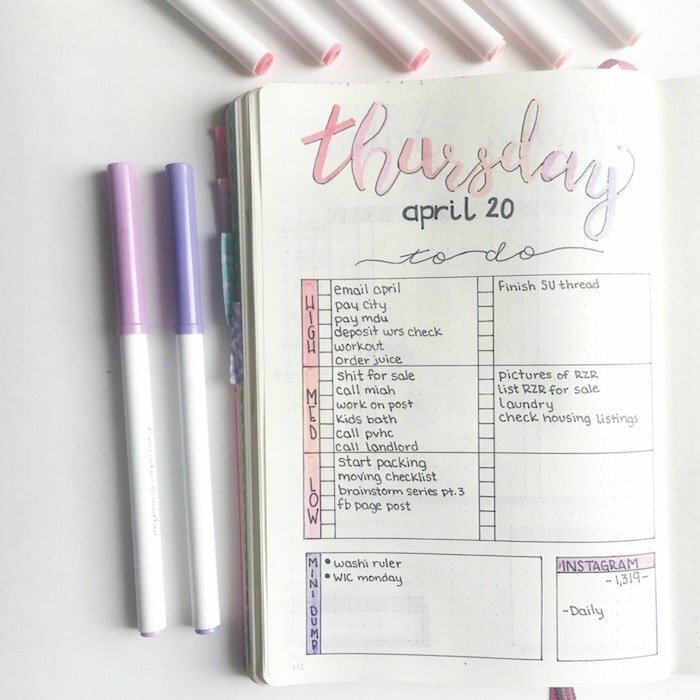 To start off, weekly logs, or weeklies, are spreads made for a specific week of the month/year to track tasks and events. Generally, this is a one to two-page spread that is added after the current monthly log. 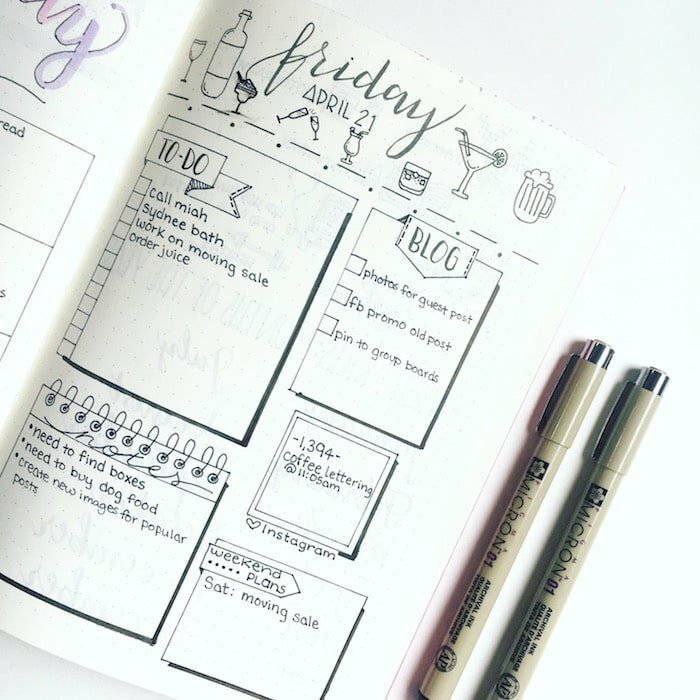 Weeklies were not one of the original modules in Ryder Carroll’s Bullet Journal system. However, they have become quite popular with the majority of the bullet journal community. I assume a lot of people consider it a vital part of the bullet journal. In a weekly log, all seven days are viewable on one or two adjacent pages. You specify a specific area of space for each day where you can add entries. Think of it like a calendar that you have zoomed in on. You have zoomed in on a specific week and can see every event and task within that week. For me, weeklies are my most used pages. On the other hand, dailies are logs for a specific day. If you go back to the zoomed in calendar reference, think of this as zoomed to the max. Dailies can be drawn out in advance, but I don’t recommend it. Instead, you would make a new daily log for the next day after filling in all of your entries on the current day. This allows you to add as much or as a little information as you like. The flexibility of dailies is probably one of their most appealing aspects. What kind of information will you add to your logs? Are you only going to be writing in big events, bills that are due, holidays, birthdays, or perhaps large work related tasks? Do you want to include a daily menu or make personal journal entries about the day? Draw up a sample day, and add tasks and events that you would want to add to your logs. Add anything else you would want to note in your journal for the day. Is there a lot? Is there very few? How much time can you dedicate to planning? Obviously, the system in its entirety works best when you are consistent. But, I can’t pretend that some days my bullet journal gets pushed to the wayside. Be honest with yourself. Will you use it every day, or would you be more likely to sit down during the weekend to pre-plan your week all at once? What is your overall goal with your bullet journal? This relates to the first question. Are you looking to be more organized and productive? Are you trying to reach a fitness goal or tracking mental/physical health? These questions may help you decide what you want in your weekly or daily logs, which can, in turn, help you decide which is best for you. The most relative question from above is probably space related. 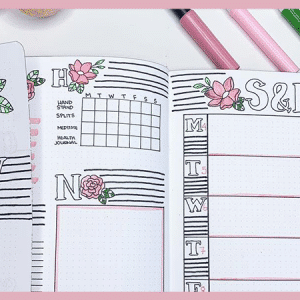 Will you have enough space to use only a weekly spread and still get all of your information? The other two questions are important. But, you can make daily logs without dedicating a bunch of time to them. They don’t need to be fancy if you don’t have time or the desire to make them fancy. They just need to be labeled with the date. That’s it. So, unless you know that you won’t be using your bullet journal or a daily basis, time shouldn’t be a deal breaker. 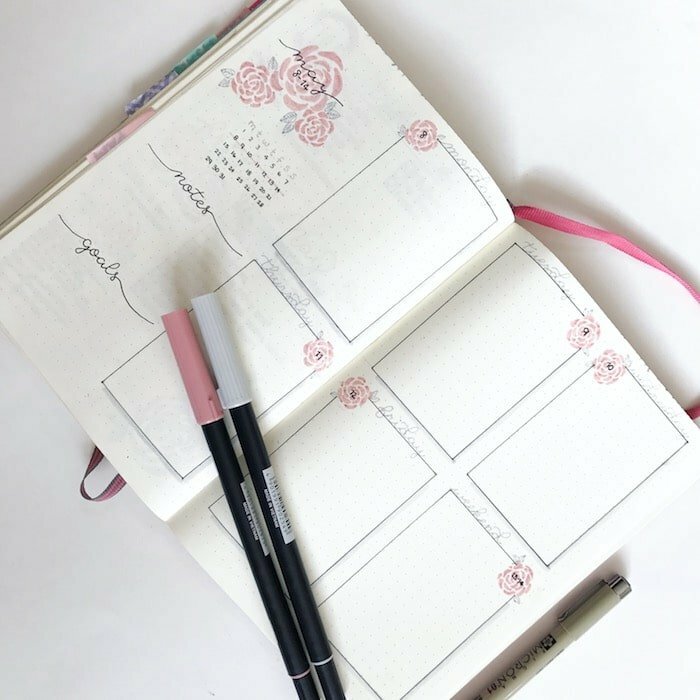 As for your goals, you can always incorporate your goals into collections rather than weekly or daily spreads. You can stick to basic tasks and events in your daily and weekly logs. I have been using a bullet journal for over a year, very consistently. I have used both dailies and weeklies. But, I’ll give you my preference and tell you why I do it. It’s kind of a big secret. Not! I always use weekly logs, whether I’m using dailies or not. I am a very visual person, and I like to see everything on one spread. Well, at least all the important stuff. I usually create the next week’s spread between Friday and Sunday. Then I immediately add in any appointments, events, or tasks that I know about in advance. If I have a week where I know I have a lot of little things going on, I also make dailies. In this instance, only the big tasks and events are added to my weekly log, while the smaller tasks are added to each daily log as they come up. In my case, I’m at home with two kids all week. I generally have a lot of housework to do. But, some weeks I have playdates scheduled, a few blog posts that I have planned to go out, social media work to do, housework, and maybe some personal goals to act on. This is when daily logs come in handy. I have unlimited space to write in tasks and events. And I can classify them into blog related, home related, etc. So, my preference is to always use a weekly log, and when necessary, use daily logs. We’re back on the topic of flexibility. Don’t feel pressured to stick with one or the other or both just because you start that way. You can change things up as you go. Some days you may need more space, and some days you may need less. Use whatever technique keeps you the most productive. If you find yourself getting burnt out having to write out daily logs, skip them for a while. And if you miss a day, it’s not the end of the world. Just jump back in and create your next log. I’d love to hear your preference on weekly logs vs. dailies. Which do you use, or do you use both? Let me know in the comments. Greetings, Erin, I am really enjoying this series. I am a long time user of some form of bullet journals, but I always learn something from your posts. I’ve been pinning quite a few of them to share with others. Keep up the great writing. I can’t thank you enough for the kind comment. I am trying my best to add to the bullet journal community in a helpful way. I love the system and think it can benefit anyone in some way. So, I very much appreciate the kind feedback. Thank you again. Love your weekly layout! I, too, use both weekly and dailies, mostly to keep track of work projects, I plan my week with those projects in mind, then break them down in the dailies. Since I have to track my time by project and other activities, my journal is work-based for the most part. I do keep track of some personal stuff, but find it is not all that necessary, except birthdays, etc.